Be prepared for the EliSpot future and analyse your enzymatic assays and your multi-color FluoroSpot assays in the same innovative AID Reader. 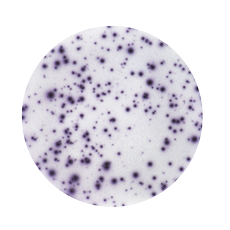 The EliSpot assay is known to be one of the most sensitive cellular immunoassays available, allowing the detection of functional cytokine producing T-cells even at the single cell level. So far, one limitation in EliSpot technology has been the lack to detect T-cells which simultaneously produce multiple cytokines. To overcome this problem researches have begun to develop EliSpot assays based on fluorescent labeling. Detection of multiple cytokines secreting expressing lymphocytes such as double IFN-γ/IL-2 producing T-cells with this EliSpot (FluoroSpot)-technology provides additional and new informations regarding the clinical outcome in patients with various infections and other clinical questions. IFN-γ assay done with traditional enzymatic (left) and with fluorescent-based EliSpot/FluoroSpot (right) and analysed with the AID EliSpot software. Sensitivity of both assays is the same, as the total number of spots in both wells is nearly identical. AID has developed an unique EliSpot device capable to analyse Fluorospot as well as traditional enzymatic-based EliSpot assays. Since commercially available validated FluoroSpot assays are on the market since summer 2008, it is reasonable to use a hybrid-technolgy, which allows to interprete enzymatic- and fluorescent-based assays with only one device. The AID iSpot Reader is still as fast as the original AID Readers and completely interpretes a 96-well fluorescent plate within 6-7 minutes. The AID iSpot Reader can switch between both approaches without hardware changes and without loss of sensitivity in the assay analysis. The sophisticated new overlay-technology allows for detailed interpretation of double-expressing T-cells in every well. The adapted fluorescent interpretation software especially facilitates working with these subtypes of cells. Multiple cytokine detection in one well with up to 7 narrow band fluorescent filter due to the custom-made 7&1 AID filter cube. The AID iSpot reader comprises the same outstanding functionality, such as layout-generator, rule-compiler, various export possibilites etc, as the well known AID EliSpot Reader Systems. Fluorescent-based two-color IFN-γ/Il-2-assay interpreted with the AID EliSpot software: The AID reader captures the Cy-3 / IL-2 signal (A) before capturing the FITC/IFN-γ signal (B). The software overlays both images (C) and creates an artificial image highlighting the double-stained spots (D). 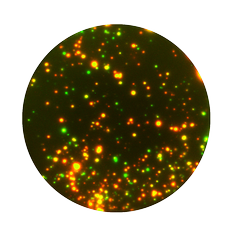 With the forward-looking AID technology Elispot researchers will soon be able to do real multi-color FluoroSpot assays as well. The AID iSpot is equipped with a 7&1 filter cube which theoretically allows analysis of a maximum of 21 different dyes in one well. Work is already in progress with three different dyes per well. On the following pages you will find information on the AID Elispot Reader Systems and the Elispot assays developed and produced by AID.